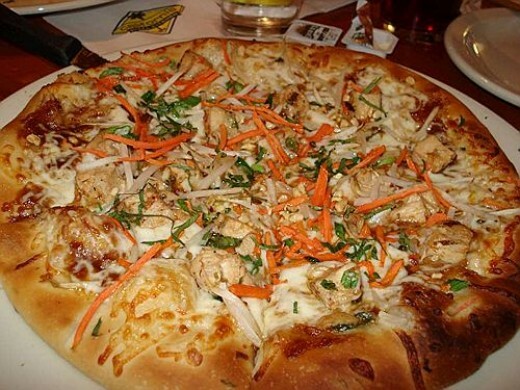 Here is a restaurant copycat recipe for California Pizza Kitchen's Thai Chicken Pizza. This one is an original! The basic ingredients are marinated chicken, mozzarella cheese, green onions, bean sprouts, julienne carrots, cilantro and roasted peanuts. 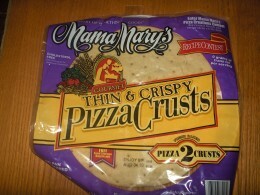 Read on to learn how to make this pizza at home using simple ingredients and limited cooking skills. I've simplified this restaurant copycat recipe by using a prepared pizza shell, rotisserie chicken and bottled Thai peanut sauce which are all items that I found at my local Walmart. Place chicken in a small bowl and drizzle with Thai peanut sauce. Spread a thin layer of the peanut sauce over the pizza shell. Cover sauce with 1 cup of mozzarella cheese. Distribute the chicken, scallions, bean sprouts and carrots. Add the rest of the cheese and top with the chopped peanuts. Bake in the oven according to the pizza shell directions.